CANNES, France—Veep may be a comedy that revels in double standards, but star Julia Louis-Dreyfus says she believes the show might actually be helping solve the gender-imbalance issues that often drive its plot. 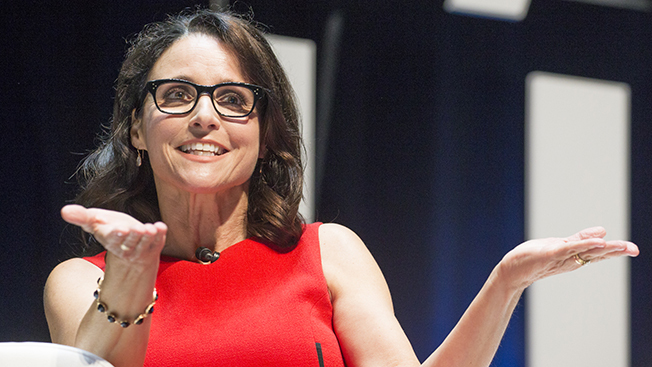 "There is a tremendous inequity in Hollywood and in politics, and I would say globally it's challenging to be a woman and succeed," Louis-Dreyfus told her audience at the Cannes Lions. "There's a lot of fun to be made of it, and in so doing maybe you can move the needle a little bit." Moderated by CNN's Christiane Amanpour, the "political address from the queen of comedy" also included Time Warner CEO Jeff Bewkes. As chief exec for HBO's parent company, Bewkes said he's proud of Veep's success, which he said is most visible in the daily interactions of Washington's political establishment. "People in Congress and the executive branch, they refer to themselves or point to other people as [Veep's] characters," he said. "'There's a Jonah, there's a Dan, there's a Ken.' That's a tremendous testament to the show and how it's become part of the cultural conversation." One central element of the show is its gleeful and abundant use of obscenity, which Louis-Dreyfus said is largely a representation of how politicians act when they remove their public masks. "We show the process in front of the camera, in front of the curtain and then what goes on behind the curtain," Louis-Dreyfus said, "The language is very often a nice sort of metaphor for exactly that—what we can say and what we can't say, who you're pretending you are and who you really are." Bewkes said that while HBO's programming focus remains on entertainment and not activism, he believes Veep and John Oliver's Last Week Tonight are both helping spark important conversations that might not be generated by traditional news coverage. "The satirists have a real voice in the political process," said Bewkes, "and sometimes, particularly with young people, have a way of breaking through." Louis-Dreyfus said HBO and Time Warner deserve credit for supporting Veep despite its frequently twisted and provocative sense of humor. "I've never had the experience I've had at HBO and the creative we do, which is utter and total support," she said. "There's a feeling like you've been hired to do this, so do it. You've been trusted to do it."